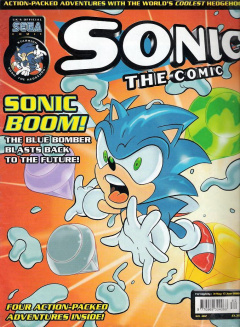 Sonic the Comic #182 is the one-hundred and eighty-second issue of the Sonic the Comic series by Fleetway Editions Ltd.
1.1 War of the Worlds! 8,000 years ago, the beginning of the war between the Echidna and Drakon Empires has led to the creation of Chaos, who flexes his claws in marvel at the sheer amount of power he feels from the Chaos Emeralds as Sonic and Tikal look in horror. Knuckles proceeds to lead his fellow Echidnas into driving the Drakon invaders from the city as the Great War truly begins. Tikal asks Sonic how he's met Chaos in the future and what has become of the Echidna race, though Sonic is hesitant on telling her that the only known survivors are Knuckles and Doctor Zachary, and instead enters the fray to aid the Echidnas. Desperately fighting Chaos' fear effect, Sonic races toward the monster, hoping to destroy it there and then, believing he would then be able to prevent Johnny's death in the future. Unfortunately, this attack only results in him getting stuck in his watery belly. As Sonic struggles within, Pochacamac uses the power of the Chaos Emeralds to transport Sonic back to the present day. This act weakens the monster, giving the Echidnas their chance to attack. Back in the present, Knuckles and the remaining Freedom Fighters arrive at Dr. Robotnik's mountaintop retreat in search of the Chaos Emeralds, as does Chaos. Robotnik delights in the fact that since the heroes are here, they will all be destroyed in the grand finale, telling Grimer that it's up to him to come up with the plan, since he released Chaos. However, he notices that Sonic isn't here. As if on cue, Sonic bursts out of Chaos' chest as the monster remembers what happened and tells the hedgehog that Pochacamac has only delayed his destruction for 8,000 years. Meanwhile, 8,000 years earlier, the Echidnas succeed in driving out the Drakons for the time being, with Tikal musing upon Sonic's fate, while Knuckles questions how he still exists in the distant future. Speedlines: Sonic answers questions from readers regarding Knuckles' family, Sonic figure requests, the setting of Sonic the Hedgehog: The Movie, and storyline suggestions. Graphic Zone: Fan art submitted by readers. The theme for this issue's Graphic Zone is "International Escapades", featuring Sonic, Knuckles and Robotnik in outfits from across the globe. Owners of the printed art each won a Sonic the Hedgehog digital watch.